This pattern is fully illustrated with detailed step-by-step instructions for two bands that use size 8 seed beads and either Czechmates brick beads (first and third bands in the photo) or Rulla beads (second and fourth bands in the photo). Because Rulla beads aren’t quite as wide as Czechmates brick beads, the seed beads sit closer together and may buckle a smidge.They certainly are pretty and fun to work with, though. Make a pretty necklace with tila beads using our free pattern. 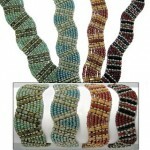 U need tila beads, seed beads 11\0 and seed beads 15\0. This necklace uses both the tile and the brick to create a structured Art Deco design. Czech Fier-polished beads, 1.8 mm cubes, crystals, and seed beads complete the piece. I think any color combination would be fabulous in this design.Hopefully, you’ll be able to find the new Czechmates Brick in bead stores soon! Blessings and happy beading! I think you can see that the beads you use can make a big difference in the outcome. I used some irregular Matsuno copper beads in the sample on the far left and the netting is all wonky. The sample on the far right looks pretty neat but the netting sticks up a little because the SuperDuo beads that I used are short and fat. The sample in the center is the best of the three because the SuperDuo beads are long and thin, I used good quality seed beads and I also used Nymo B thread, which is extra fine. I loved Jean Campbell’s post last week on the difference between Superduo and Twin beads so much that I thought I’d follow up this week with a few more of the new shaped beads. If you missed Jean’s in-depth look at two-hole seed beads, see her post here.